Please note that the content of this book primarily consists of articles available from Wikipedia or other free sources online. 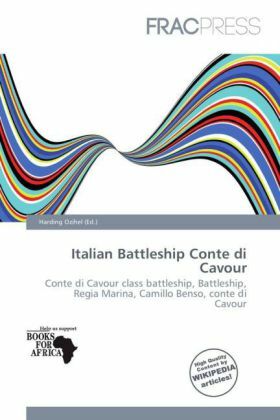 Conte di Cavour was an Conte di Cavour class battleship, that served in the Regia Marina during World War I and World War II. It was named after the Italian statesman Count Camillo Benso di Cavour.Built to a design by Chief Engineer (Tenente Generale del Genio Navale) Edoardo Masdea, Conte di Cavour was based in Taranto, in the impending war against Austria-Hungary (World War I). At the beginning of the war, 24 May 1915, Conte di Cavour became the flagship of the Rear-Admiral Luigi Amedeo di Savoia. During the war, the battleship had no active missions, since it was impossible to engage the enemy: it performed 966 hours of training exercises compared to 40 hours spent in 3 war actions.